While NFC-enabled Android smartphones and tablets can read NFC/RFID wristbands, they tend to be slow readers and generally require careful placement to the target. We were pleased to see that Famoco’s FX100+ device has significantly improved the reading speed and broadened the sweet spot. Their purpose-built NFC reader runs Android OS 4.4 (KitKat) and can be deployed in the field as a handheld or mounted device. 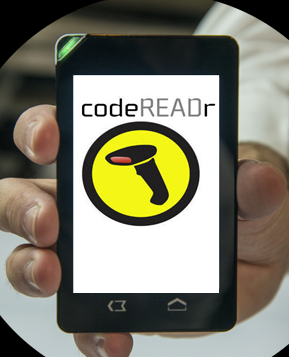 With our codeREADr app installed from Google Play it can also quickly and accurately scan barcodes. TheFX100+ includes a built-in MDM solution to remotely control applications and devices from their centralized Over-The-Air (OTA) device management service. Our ticketing clients were the first to use this device for validating wristbands at festivals. We are now also working with our institutional and enterprise clients to help them track attendance and assets globally. If you would like further information you can Nico Passaro (nico.passaro-at-famoco.com) at Famoco directly.